I am so happy to be guest posting here at Adventures of a DIY Mom. 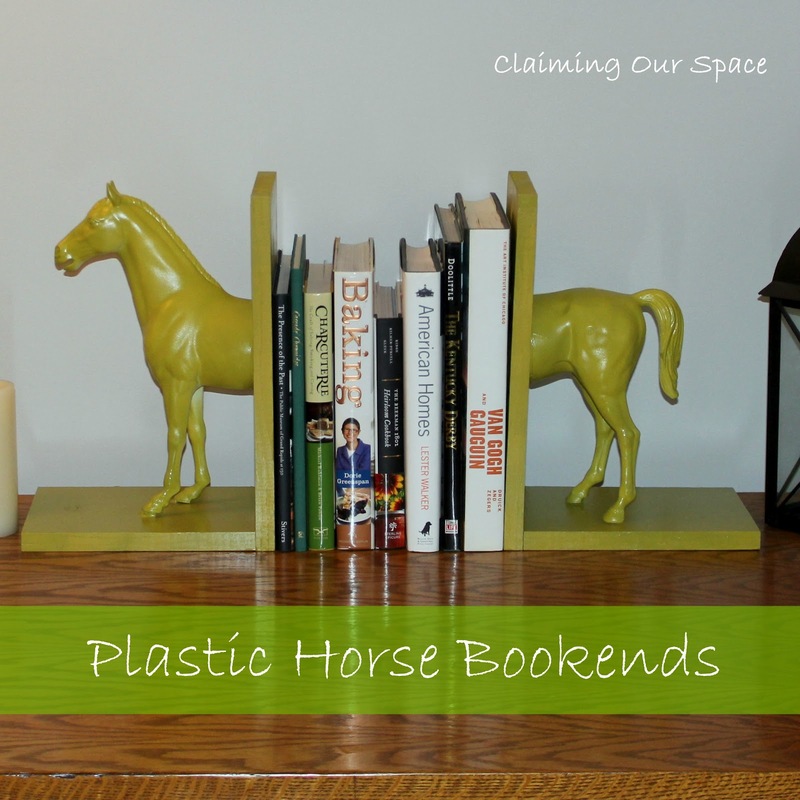 I hope you like my Plastic Horse Bookends. Don't forget to head over to Claiming Our Space to see the great project Rachel has going on. I am inspired to tackle some of the furniture pieces in my basement. 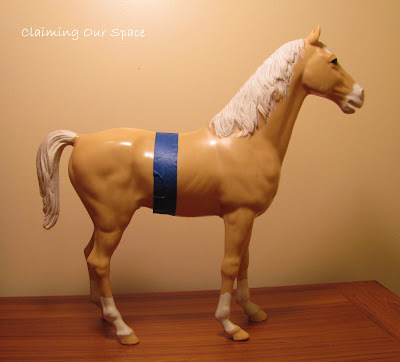 I was horse-mad as a kid and had horses all over my room. Over the years, they were given away, broken, or donated but a few managed to get boxed up. 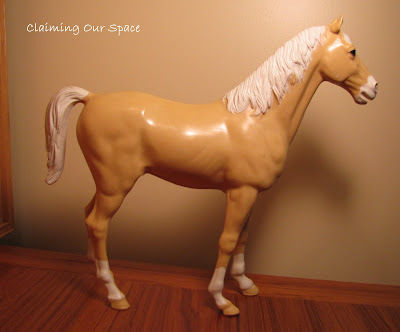 I had previously turned one into an art piece and when I found this beautiful palomino in another box, I knew I had to transform him as well. This project is a bit time consuming, mainly because of the wait time for the drying paint, but I really like how it turned out. 1. Start with your large plastic horse. Mark with tape where you will want to make your cut. 2. Make your cut. 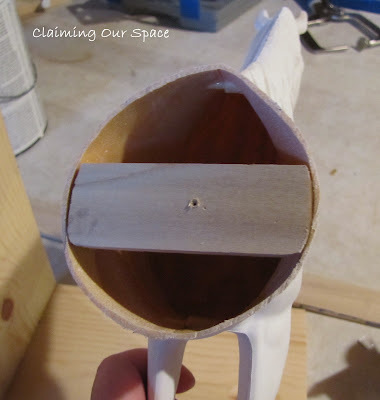 If the edges are a bit rough, sand them with the sanding block. Give each side a quick spray with the primer. 3. 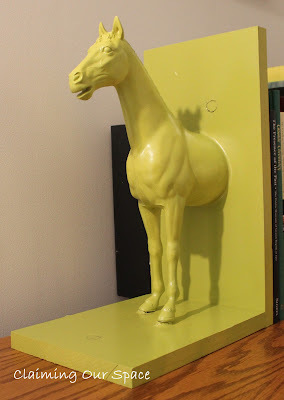 My horse was hollow so I needed to add an additional support to screw into the wooden part of the bookcase. I cut 2 small pieces to fit inside, rounding the edges. 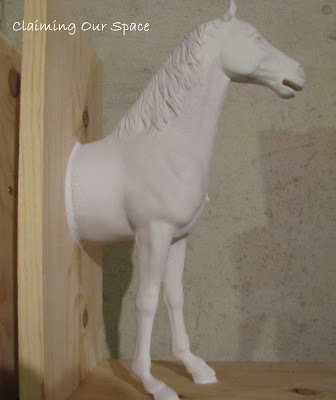 I used the gorilla glue to secure it inside the horse. 4. 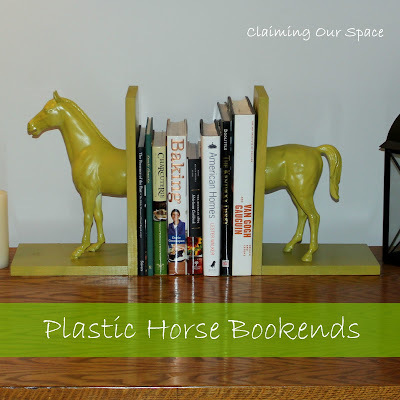 I used my Kreg jig drill the holes to secure the pieces of wood for each bookend. I used the wood glue for a little extra insurance. If you don't have a Kreg jig, just make sure to pre-drill your holes so the wood doesn't split. 5. 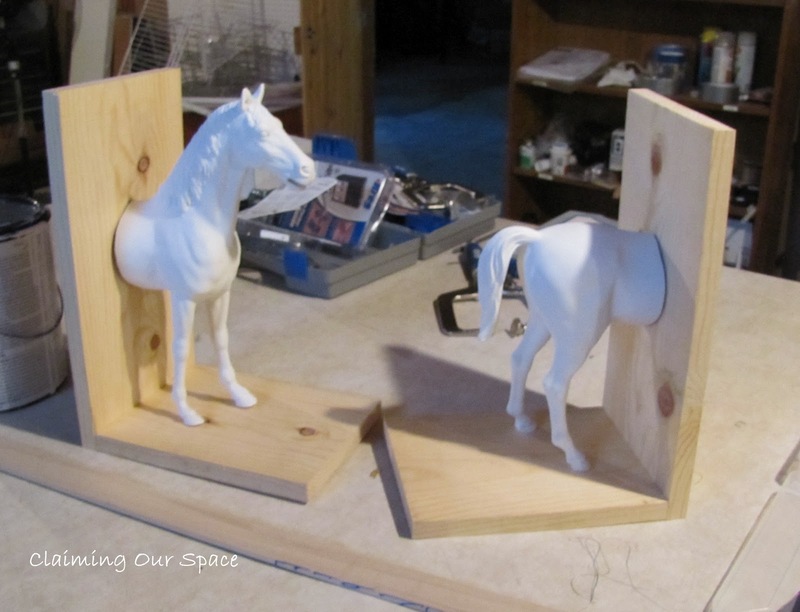 To secure horse pieces to wood, I pre-drilled a hole and screwed everything together. 6. Using caulk, fill in any gaps. 7. Give everything a spray and you are all set. I used Krylon Ivy Leaf. It is the same green that is in the fabric for the chair I am reupholstering. 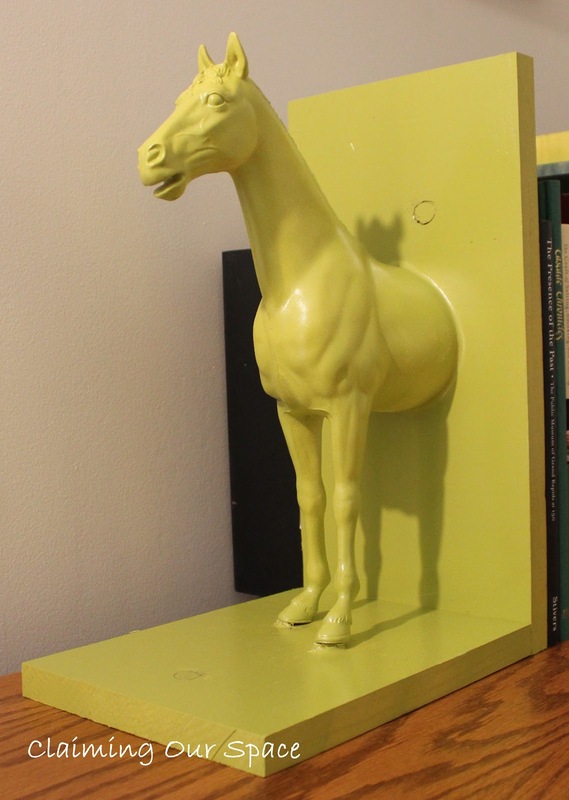 So if you come across a plastic animal from your childhood, don't throw or give it away, turn it into bookends so you can see it every day. I like that a piece of my childhood has been re-imagined in my present. Thanks for swapping with me today! It was great fun. This is really great! 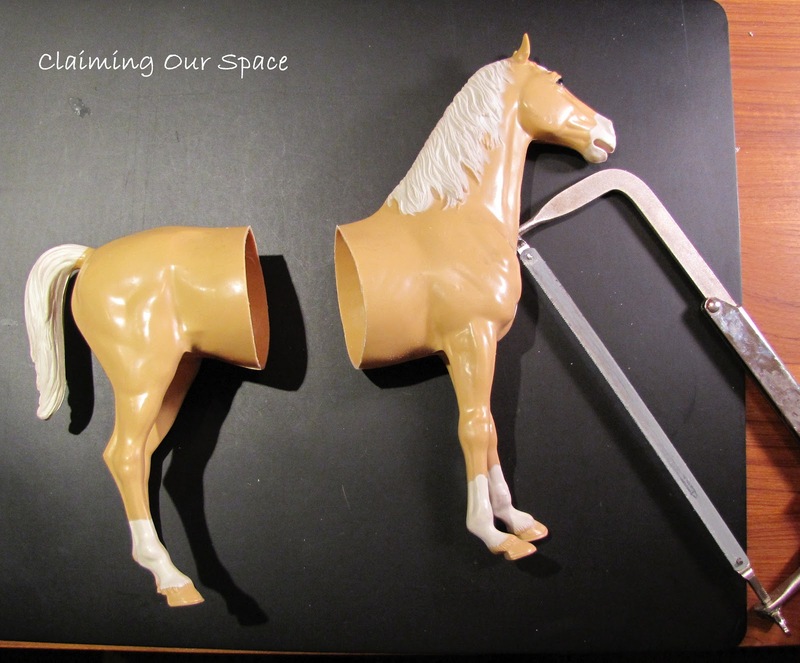 Love reusing items. Great project!